Oxford’s alumni oarsmen staged a classic recovery to win the 23rd Veteran Boat Race by just under a length in one of the most fascinating editions of the event, twelve months on from being disqualified for fouling Cambridge last year. It was a tightly fought and strategic contest, umpired for the second year running by Sir Matthew Pinsent, who will take charge of the Women’s Boat Race on Saturday 23 March. The race was rowed on a low rising tide, allowing the coxes to cut the corners more than usual. 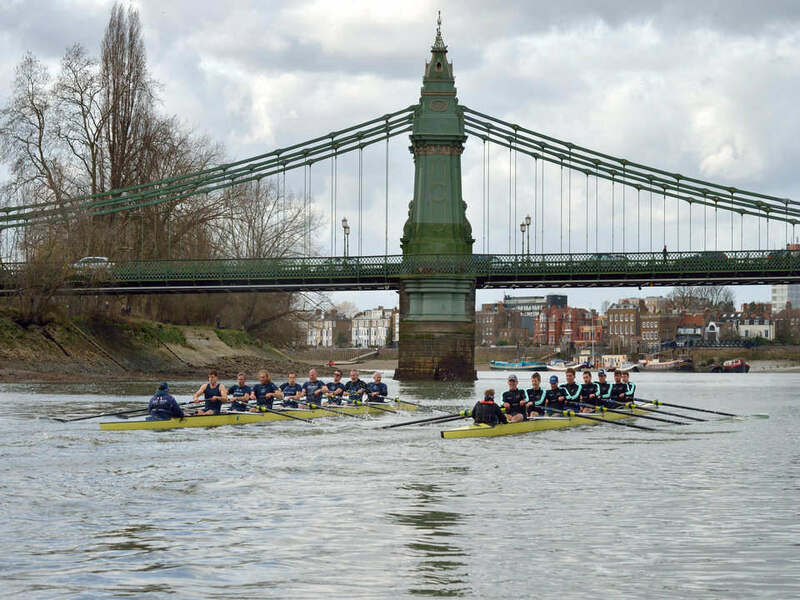 Winning the toss, the Dark Blues promptly chose Surrey, stating that they intended to make full use of the short but very tight bend in their favour between Hammersmith Bridge and the finish line marked by a large dead tree stump at Furnivall Steps. At first this looked like a foolish choice. Starting a little behind the University Stone, the two crews set off with blade-tips very near to each other, and Cambridge immediately took hold of the race. Rating 45 off the start and settling to an initial 37, they kept a cadence higher than Oxford’s for the first minute, and simultaneously maintained the pressure on the Dark Blues’ steering, Cambridge cox Ed Bosson pressing Oxford further to stroke side. Pinsent’s white flag was in operation within the first 30 seconds, the first few times warning the Light Blues. Before the race reached London Rowing Club Cambridge stroke and Olympian Matthew Parish had taken his men nearly a length ahead of Oxford, but there they stuck. By now both at 35 strokes a minute, the two crews battled down the moored boats, Pinsent at times warning them both. As they took the corner at Craven Cottage wide to the Surrey bank, he warned both again, repeatedly, with Oxford putting in a strong push at Barn Elms to stop Cambridge taking clear water and desperate to cling to contact. For the next four minutes it was hammer and tongs, Oxford pushing to gain ground, Cambridge fending them off and again squeezing them towards the Surrey bank, but the margin unchanging. Passing the Milepost the Light Blues had 2.45 seconds advantage, but as they had to let Oxford come back into faster water to pass the navigation buoys, and as the first corner ran out, the challengers scented blood. Second by second the Oxford stroke, Olympian and world medallist Tom Solesbury, inched his crew back into contention as Pinsent continued to warn both crews. Passing Harrods Depository they were only a few seats behind, and by Hammersmith Bridge, tucked well in towards the southern buttress, they had gone fractionally ahead. But then came the slam-dunk. As Oxford cox Peter Hackworth steered to take the stroke-side corner, his crew had all the momentum and raced ahead to win with an official verdict of three-quarters of a length. This was Oxford’s eighth win in the event and their first since 2015. All times rounded to the nearest half-second.